During Super Bowl 50 Frito Lay ran an ad for their Doritos chips which had abortion rights groups instantly outraged. 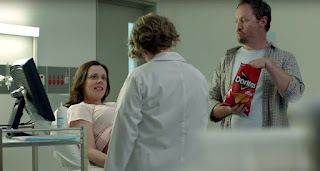 If you haven’t seen the commercial, it features a mom and dad watching their child’s ultrasound, and the dad is eating a bag of nacho cheese Doritos. Every time the dad lifts a chip to his mouth, the baby reacts by reaching for the chip. You read that right. Apparently its an “antichoice tactic” to humanize a fetus. In other words, it is a dirty trick to make baby humans look like baby humans. Here’s what I’m not buying: Doritos didn’t humanize the baby, God did. He creates each life, giving children unique human DNA from the second of conception. I realize that unborn children will not grab for a potato chip, but ultrasounds commonly show them wave, kick, hiccup, blink, sing, dance, and other human things. This anger over a funny commercial only exposes NARAL’s fear that people will find out that an unborn baby is actually a living person, and therefor reject their barbaric business. That is why they fight tooth and toenail to prevent laws like the one in Texas which requires women to have an ultrasound prior to aborting their babies. They don’t want women looking at ultrasound machines that might humanize the fetus. Conversely, the people at NARAL, Planned Parenthood, and other abortion-defending groups know the truth, but they suppress the truth. Knowing full well that these “fetuses” have beating hearts, working organs, and unique fingerprints, they use terms like, “product of conception,” “clump of tissue,” and “blob of cells.” This suppressing of facts helps deceive millions of young ladies into ending a life. Maybe if we did more humanizing and less suppressing, Americans would reject this legal murder of the unborn once and for all.